Autumn is coming! It’s almost time to break out the sweaters and hot cocoa! To celebrate the season, we’re offering two award-winning titles, In the Middle of Fall by Kevin Henkes and Applesauce Weather by Helen Frost, for just $8 each when you shop by September 30! In the middle of fall, the sky is nearly gray, the leaves have already turned, and all it takes is one gust of wind to turn the world yellow and red and orange. 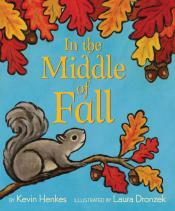 Caldecott Medalist and award-winning author Kevin Henkes’s striking text introduces basic concepts of language and the unique beauty of the fall season. Laura Dronzek’s expressive paintings illuminate pumpkins, apples, falling leaves, busy squirrels, and the transformation from colorful autumn to frosty winter. Kevin Henkes is an author and illustrator of children's books. As an illustrator, he won a Caldecott Medal for his work on Kitten's First Full Moon. Two of his books, Olive's Ocean and The year of Billy Miller, are Newbery Medal Winners. In 2016, his picture book Waiting was named both as a Caldecott Honor Book and a Geisel Honor Book -- only the second time any author has received that combination of awards. 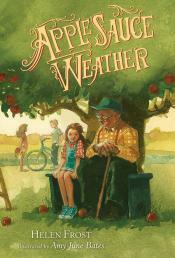 In this touching poetic novel, a fall apple ritual—along with some inventive storytelling—brings a family together as they grieve the loss of a beloved family member. When the first apple falls from the tree, Faith and Peter know that it’s applesauce weather. It also means Uncle Arthur should be here to tell his stories, with a twinkle in his eye as he spins tales about how he came to have a missing finger. But this is the first year without Aunt Lucy, and when Uncle Arthur arrives, there’s no twinkle to be found and no stories waiting to be told. Faith is certain, though, that with a little love and patience, she and Peter might finally learn the truth about that missing finger. Helen Frost has published poetry, children's books, anthologies, and a play, as well as a book about teaching writing. She has taught writing at all levels, from pre-school through university. Over the years, her books have won numerous awards and honors. She Helen lives in Fort Wayne, Indiana. She is married and has two sons. She lives in Fort Wayne, Indana and enjoys travel, hiking, beadwork, kayaking, and gardening especially to welcome birds and butterflies.